General description : ONLY 1500 MILES SINCE NEW, 501 HP ROUSH 427 V8, 4 WHL INDEPENDENT SUSP, 5 SPD! On the outside this just looks like a beautifully built 1965 Shelby Cobra, but then everybody else on the track starts wondering why you can smoke them all. That's because this is a Backdraft Racing Cobra. It means a 501 hp Roush V8, a fully independent suspension, four-wheel disc brakes, beefy five-speed gearbox, and a whole host of other goodies to make this one of the baddest Cobra you've ever laid eyes on. 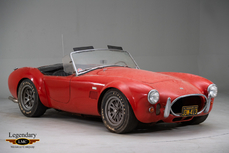 The paint makes this one an instant standout even among other Cobras. The classic racing color scheme is given an update as the bright white funnels plenty of attention to the red full dual racing stripes. And the Cobra always looks aggressive even when standing still. 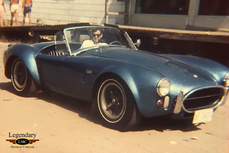 The sweeping fender arches, large side gills, and hood scoop are what makes these sports car legends. 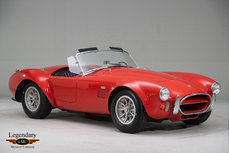 You can see this so crisply because Backdraft offers one of the highest quality bodies in the Cobra industry. This one has just the right touches of brightwork on the quick jack bumpers, roll hoop, racing gas cap, and covers over the side pipes. And those Halibrand-style knock-off wheels are a must-have for a truly distinguished Cobra. The red bucket seats are great against the exterior colors. If you look closely, you can see better bolstering in the leather inserts than you get in most Cobras. And with the dash and door panels matching this, you get a distinct and aggressive look. This one was built in the grand tradition of true competition-ready machines with a wood-rimmed steering wheel, forward bent gearstick, and a dash full of gauges dominated by the large speedo and tach. You even have race-ready Crow harnesses. When you lift the hood, the air topper and valve covers announce that your big block was built by true performance masters. This Roush 427 cubic-inch V8 has all the right pieces, including a Holley four-barrel carburetor, Edelbrock intake, MSD ignition, and headers to feed the growling side pipes. 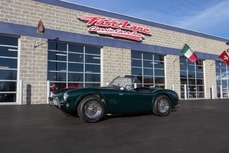 The full package is rated at 501 horsepower, and we have the dyno sheet to prove it! All this power is only at its best when you have the right components to control it. That's why you get a Tremec TKO600 five-speed manual. On the road or racetrack, you'll instantly feel the confidence the fully independent sports suspension gives you. Plus, there's superior control with the modern grip of the Goodyear Eagle F1 tires that are backed up at each wheel with disc brakes. We have the factory buildsheet and the maintenance records to prove this is a well-respected 1,555 miles on the odometer. 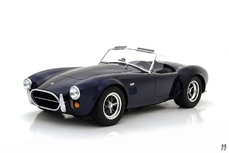 This Cobra is more powerful and composed than just about anything else you can find. So when you look at the price for an example that's barely broken in, then you already know how quick you need to be to grab this deal. Call today!!! 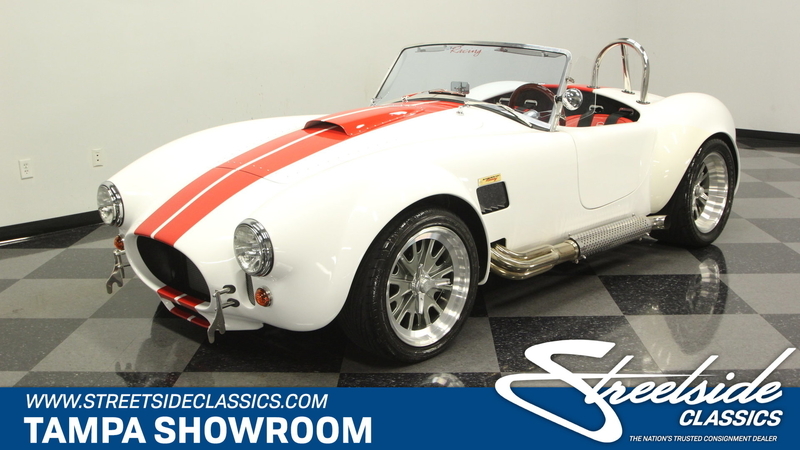 1965 Shelby Cobra 427 427 V8 is listed for sale on ClassicDigest in Tampa, Florida by Streetside Classics - Tampa for $59995.